In May, Jewish organisations will be celebrating the 60th anniversary of the founding of the state of Israel. This is understandable in the context of centuries of persecution culminating in the Holocaust. Nevertheless, we are Jews who will not be celebrating. Surely it is now time to acknowledge the narrative of the other, the price paid by another people for European anti-semitism and Hitler’s genocidal policies. As Edward Said emphasised, what the Holocaust is to the Jews, the Naqba is to the Palestinians. In April 1948, the same month as the infamous massacre at Deir Yassin and the mortar attack on Palestinian civilians in Haifa’s market square, Plan Dalet was put into operation. This authorised the destruction of Palestinian villages and the expulsion of the indigenous population outside the borders of the state. We will not be celebrating. In July 1948, 70,000 Palestinians were driven from their homes in Lydda and Ramleh in the heat of the summer with no food or water. Hundreds died. It was known as the Death March. We will not be celebrating. In all, 750,000 Palestinians became refugees. Some 400 villages were wiped off the map. That did not end the ethnic cleansing. Thousands of Palestinians (Israeli citizens) were expelled from the Galilee in 1956. Many thousands more when Israel occupied the West Bank and Gaza. Under international law and sanctioned by UN resolution 194, refugees from war have a right to return or compensation. Israel has never accepted that right. We will not be celebrating. This week’s economist has several iarticles on the Arabian Gulf. It’s quite disappointing to be honest, especially when you compare it to its amazing coverage on other topics like fund management (really recommended, if long reading). The coverage is superficial and not very novel, and some of the statements just seem ridiculous. Two stuck to my mind: One is the central claim that the Gulf countries are managing their wealth better than the seventies. That may be true (in some countries mind you, I don’t know if I’d include Bahrain), but that’s like saying a driver with -15 vision is better than a blind driver. The other one is that simply because the wealth is being invested by the private sector this time around, this means it’s better utilized when compared to the mainly government-driven investments in the 70s, which were marred by ridiculous grandiose projects and corruption. 1. Much of this “private sector” is an illusion, it’s not what is meant by the private sector in the west. Much of it is by the same guys who made up the “government” previously, except now they don’t even have to pretend that they have government duties to deal with. Even though corruption existed before in government, at least some of the money was kept in the name of government. Now it’s all in the “private sector hands”, which remarkably are still the same people! It ain’t in your or my hands (oh wait, I forgot most of us are nidoers, yes it is in our hands). It’s what Baumol and Co. would call oligarchich capitalism, the kind that results in the worst type of capitalism there is: Few families pretty much owning everything and not giving a damn about the rest. This is not a benevolent private sector, but the phrase “private sector” is all the rage nowadays, so they’ll sure use it to their advantage. 2. The fact that it is the private sector does not mean that somehow by nature it will be better than the government, as the article seems to assume. There is nothing absolute that makes the private sector better by right of birth. It is just as likely to engage in ridiculous grandiose projects as the government would have. Take the example of the ridiculous grandiose resorts being built in EVERY SINGLE GULF country right now, include our own illustrious Riffa Views and co? First, do you think all of these projects, in every single country, will work and be prosperous in the long run? Especially considering you’re all copying each other? Have you taken a look at the Gulf recently? It’s boiling hot, unbelievably sticky, and the scenery is not exactly breath taking (except in Oman). It is not exactly a tourist hot spot, and no, you cannot all be Dubais. Dubai is built on being exceptional and the most excessive, “the best”. You can’t all be the “best”, it goes against the concept. These projects are just as insane as the plans to produce and subsidize wheat on a mass scale in Saudi Arabia in the 70s (which basically amounted to exporting Saudi water abroad, not a good idea in a desert country). If you all hire Charles River and Co, then you’ll all get Charles River advice! It won’t produce very innovative or original thinking, and in fact you’ll probably end up competing with each other and doing the same thing. But hey, we’re all enchanted by the white man’s burden aren’t we? I mean, these are big shot multinational consultancy names, run by Ivy League graduates, surely they know so much more about our countries than us? Let’s just delegate the whole economic policies of a country, the most important thing there is, you know, the things that usually ministries, parliaments and study groups devote most of their energy to in developed countires; let’s rid ourselves of that headache and delegate it to multinational consultancy companies! Better yet, let’s give them a blank cheque and the green light to do whatever they want, no questions asked! They’ll design our education system, our labour market, our health policy, how to manage oil wealth, you name it. I mean why not? We import everything else: labour, goods, cars, foods, you name it. Why not just import economic policy setters as well? That’ll make us look sophisticated, civilized and developed. Everyone will look up to us, just like when we built the biggest fountain the world or the biggest flag in the world. It’s worth a read anyway, especially if you don’t have much background in the subject and are interested in a summary of the issues. The next 2 and half-3 months are going to be the most crucial in my life so far. I’m going to have to load up on m3assel and go undergound for a long time. Hence I can’t promise that I will post much. I will try to whenever I can but I doubt it won’t be much. I’ll be back though. Wish me luck, thanks for all your comments, input and take care! -The traffic in Bahrain is becoming more and more unbearable. It’s starting to resemble Tehran and Beirut. In the last two weeks I’ve had to twice get out of the car and spar with a couple of bozos for blocking the road because they were too lazy to park half a minute away and walk; instead deciding to park in the middle of the road to order their shawarmas and in the process making me and the rest of the commuters’ wait for their highnesses to fill their guts. Mark my words, road rage will become a regular scene in Bahrain. I suggest you keep a 2×4 handy in the car for protection. -If Inflation in housing is 29.2% and is 38.4% in food goods, and if these are the two biggest components in inflation, how is overall inflation only 3.5%? -It’s hard for me to quantify or express the magnitude of anger I have towards the French embassy visa section and whoever is in charge of that hellhole (although the Arabic lady who meets the applicants was nice enough). They are sadists who get off on power trips and their pathetic regulations that make people’s life miserable. Let’s just say I wouldn’t be one of the first to express sorrow if that place was to be knocked down. In a perfect world Bahrain would follow Brazil and implement reciprocity in visa regulations to these countries. Unfortunately, we need their visas more than they care about ours and they know it. -I was really impressed by the Bahrain book fair and the considerable attendance there. It was heaving on both occasions that I went. However, taking a closer look I found out that most of interest was in the religious book stalls. I wonder what does it signify that most of the buzzing stalls sold books with titles like “عذاب القبر” and “الدرك الاسفل من النار”. Other, in my opinion publishing houses worthy of more attention like وحدة الدراسات العربية barely had anyone and were sometimes left unattended. I had a chat with the guy sitting in the دار رياض الريس book stall, one of the best Arabic ones out there, and he kept complaining about the very weak interest shown. I asked him where was the biggest attendance to their stalls and without hesitation he stated Saudi Arabia. He commented that their books disappear like hotcakes there (well the ones that do not get banned). Go figure. I was interested to see if they had a copy of their النصوص المحرمة by ابو نواس but unfortunately and as expected it was banned by the ministry of information. Abu Nawwas is recognised as one of the foremost Abassid poets and is known for his religious and ghazal poetry, but what many forget is that before his religious transformation he was a big drinker and a sexoholic who’d fornicate with anyone who has a heartbeat, including concubines and young boys. Not only that, he also wrote very graphic classical Arabic poetry about his escapades, and I mean really graphic. Remember this was in the second hejri century, i.e. the 700s A.D. (more than 1200 years ago). And just like nowadays people have that favourite past time of “الحط على بعض”, where they’d indulge in making fun of each other and their moms, sisters and fathers (for nidoers, this would be similar to “your momma is so fat” exchanges, except much more profane), Abu Nawwas and his Shilla would engage in dirty هجاء about each other and their family relations, except that this was done in pure classical Arabic. It is amazing the amount of swear and dirty words that are in use nowadays that are classical Arabic in origin and which were used back then. Obviously this blog is no place to list or repeat them. If you are interested in this sort of thing then I’d recommend this book. You’ll amaze your friends to no end if you can recite some of these line in your next حط session (however you should keep in mind the danger of receiving a punch in the face). Obviously there are many people out there who care about Abdulla’s and the other prisoners’ situation. Keep it up guys, and if there is anyone else who can help I urge to put the word out about their situation. Abdulla Mohsen has been in prison now more than four months. What is he accused of? Well apparently he and more than thirty others are accused of being involved in the theft of a weapon and in burning a police jeep. This, if you wll remember, happened way back in December after the protest that accompanied the funeral of Ali Jassem, who died in as yet unclear circumstances after participating in a demonstration on December 17. Dozens of people were arrested, including Abdulla. According to Abdulla, he is innocent since he wasn’t even present at the scene when the events occured, and he was arrested four days later in his house. Now I know Abdulla personally, and I find it hard to believe that he would even hurt a fly, let alone steal a gun and burn down a jeep. He is however an activist. Given the amount of activists that have been rounded up under the pretext of the theft of the weapon, it is not completely surprising that he was arrested under the same pretext as well . He also ran a blog under the name of Bahrain Eyes. In any case, several sources indicated that Abdulla’s health situation is a constant worry. Apparently he is suffering from severe kidney problems, and his family are very worried about his situation. At one point he even had to be moved to the hospital due to his deteriorating health. His family have been kept in the dark with minimal information about his status or whereabouts. The situation is very depressing. There are several reports of torture and beatings of the detainees. There isn’t much that we can do except bring attention to Abdulla’s and the rest of the detainees’ plight. Other than the Arabic forums, there has been very little coverage or discussion online about their situation, unlike previous cases of bloggers being arrested or brought to prosecution. If you have a blog or a forum or even a contact somewhere, I ask you that you please write about them, put a post up, or at least raise their issue. This is the least we can do, as one can only imagine what they are going through. but even when I compare our parent’s generation to our situation the contrast could not be sharper. No one can seriously say that we are as politically involved as they were. Don’t get me wrong, I am not saying that Bahrain is less politically active nowadays when compared to the past. Bahrain is obviously one of the most politically vibrant countries in the region. I am comparing the affluent, supposedly highly educated youth back then and now. Back then getting involved in politics was the norm. Today we dare not, nor are we interested, to even speak of the subject. Back in the sixties and seventies university students were at the forefront and indeed propelled political activism, especially those that studied abroad (which was the most back then). They filled demonstrations and political parties to the brim and even participated in revolutions (such as that in Dhofar). Brothers, sisters, friends, schoolmates, neighbours; the majority were involved or at least aware of the political situation. No one needs to be told this, just ask any of our parents. By contrast, the most educated and affluent nowadays (which us nidoers are a big chunk off) are one of the most politically lethargic groups you’d find across space and time. Why are we so disengaged, so uninterested?……. Why is that? Why is that in a region which is so obviously going through one of the most turbulent and important periods in its history, where lives, ideas, norms, economies, futures and even geographic boundaries are being reshaped and redefined? Where no one really has so much more at stake in what happens, and where nobody else stands to gain or lose more from the consequences? Indeed where no one else has any reason to be more concerned as to what happens? Is it because we live in a much more pessimistic and helpless age, where we’ve seen where the naivety and activism of our parents can lead you and where we now realize that the reality is we don’t have much of a chance to change anything? So why bother? Or maybe it’s because our parents, having become dillusioned with their experience, decided to shield us and discourage us from politics and all its follies? But are we really going to pile the blame all on our parents? Is it because there is so much nowadays in life to be distracted and occuppied with that we’ve lost sight of the bigger questions? What with all the videogames there are to finish, the premiership games to watch and the shoes to browse and buy, who can be bothered to even think of politics? I mean if you spend eight hours at mind-numbing work, then 2 hours watching tv getting tranced by nancy ajram and beyonce, then another 2 on the internet, add to this a couple of hours to take care of bodily needs, and then let’s not forget the gahwa session, when exactly, i hear you ask, do you intend to carry out a demonstration? Or maybe it is all that you stand to lose if you get involved in politics. Shouldn’t we fear all that which we might have to give up? What about your career, your family, your community status? How about all those nice things in life like drinks at Trader Vic’s, comfy sofas with 52 inch screen TVs to watch desperate housewives, or indeed the internet? How are you going to afford all of that? And what if you get thrown in jail? There is too much at stake for so an uncertain a reward. Better focus on work, money, and football. Maybe then it’s the government fault for making so much that is so important in our life dependant on absolute political loyalty or lethargy. But wouldn’t you expect the government to try and defend its perceived interests with all means available? Or Maybe it’s because nothing is clear nowadays. The government is not perfect, but the alternative is Islamists. Things are getting a bit shady in Iraq with the internal killings and all, and who we should support is not all that clear. And maybe really the Americans are here to bring us development and freedom. Plus what should you believe in? Capitalism is awful but communism turned out to be worse. And Arab unity souds nice and rosy but it didn’t work out in practice. We don’t have as clear and defined a goal and ideology as our parents did. Everything is vague and confused. Or, if we are being completely honest, maybe it’s because at the end of the day we are doing quite well, thank you very much. Yes Iraq might not be in tip top shape, and the situation Palestine is not exactly rosy either, but I can assure you everything is delightful here in the compounds of Budaiya. We feel sorry for them but what can I do for their tough luck? We are having a blast I will let you know, and all this voodoo talk about troubles and potential disasters is nothing but the ravings of a crazy doomsday fanatic. But can anyone be so naive to miss all the dangers and troubles engulfing the region at the moment? And how much that stands to affect us,our lives, everything? Why is it that so few of us bother, and if they do bother they seldom act? Why is it that for so many of us this is a pointless and boring topic that is best avoided? Why is it that we have only the courage to resort to anonymous blogs, while if the identity is public then you have to severely curtail what you dare say? Why is that Trader vics is packed on a weekend like a tokyo subway at rush hour while nidoers at a rally can barely fill a car? Why is that Tiesto can start a full blown riot while regional wars or local sea reclamation barely deserve a raised eyebrow? I honestly have no idea. In my case it’s probably a bit of many reasons, but we seriously and urgently need to think of why this is so. Because no one stands to suffer or benefit from what happens more than us. “The Minister of Finance, H.E. Shaikh Ahmed bin Mohammed Al Khalifa, said that the privatization of Al Hidd Power & Water Station came within the framework of the privatization strategy adopted by the Government of the Kingdom of Bahrain and its aim of enhancing the role of the private sector in the development process and of creating the appropriate environment for attracting more foreign and local investment. So, just like that, our water and electricity plants has been sold off to Belgian, Japanese, and British investors. As expected, there was no fuss about this in the local media. There was hardly even a mention or a comment on the sale. Everything went by smoothly and unnoticed. Let me, for emphasis sake, repeat the essence of the above piece. We have sold off the plant that pretty much generates ALL of the water and electricity in Bahrain to far flung companies in Europe and Japan. We no longer own anything that is able to produce water and electricity for us. All of our water and electricity production is in the hands of management in Tokyo, London and Brussels. Could someone tell me how is this a brilliant idea? Now, in a way, this is all part and parcel of the so called “neo-liberal” craze that has been sweeping through the region, usually at the behest and encouragement of such great institutions like the World Bank, the IMF, and consultancy firms. So what is this “neoliberal” ideology i.e. what is neoliberalism? Now I’m not going to sit here and pontificate on neo-liberalism, but I’ll give a quick rough and ready overview that is suitable for my purposes. It is basically the belief that well defined markets and private property are best and should be left to their own devices in running the economy. If there are well defined private property laws and there is a suitable judicial and administrative body to support it, economic activity should be determined primarily and solely through markets. Government intervention, if at all, should only be limited to making sure that the markets are well defined, to dealing with market failures, and that there are proper rules and regulation to support these markets. The state sector should be in no business of getting involved in economic activity, whether buying, selling, or running anything. It should limit itself to issues of transparency, regulation, protection, and enforceability. Make laws protecting business; if they are broken punish those who do break them; etc….. If, to begin with, there is no proper structure for free markets to take hold and the private sector is in shambles, then the primary goal of the state is to make sure that whatever is needed is put into effect for such markets and private sectors to emerge. In this piece I’m going to focus on this idea of selling off the state’s assets. Let’s get back to our example. JUST TO RE-EMPHASIZE, Bahrain no longer has national ownership, let alone control, of either Water or electricity in the country. Sure, it regulates the price and quality which it is sold at, but it does not own any of the plants! Now why in god’s name would anyone decide to do this, to sell off assets in the two most vital sectors in the economy that are pretty much needed for LIFE itself? Well let’s dismiss one irrelevant argument out of hand. One popular reason people give for letting the private sector take over is that the private sector is more efficient in managing and running a place. It is driven by profit and cost issues, etc, while the government sector is not and has a whole host of other political, social etc issues to deal with. Furthermore, there is constant innovation and creative destruction, while the government inevitably falls into corruption and bureacratic drag. I’m not going to go into deeply into this argument, but even if it is correct, this is no justification whatsover for selling off your assets. This is a justification for the private sector MANAGING and RUNNING the establishements. It has nothing to do with selling the places off to them. Many countries, such as France, have these vital sectors owned by the state itself but they are run by the private sector. If there are gains to be had from the private sector taking over management (and even this is debatable in this case) then let them take over running it but you don’t need to sell it off to them! So what reasons do governments usually have for letting the private sector own assets in areas which are usually the terrain of the government, let alone in such vital sectors as these (please keep in mind throughout that we are talking about ELECTRICITY AND WATER here)? Well, the usual reasons are: 1. the government is broke and really needs money 2. It is a way of attracting investment in building new plants and establishments 3. to foster competition. I think it’s pretty obvious none of these work here in the case of Bahrain. Let’s go through them. 1. This is the reason why a lot of the countries, especially in the “third world”, do this. You’re broke, you don’t have money, and you need it fast….. or simply the rulers want to make a few extra bucks through a shady deal. Now I’ll assume the shady deal one doesn’t apply in our case. Either way, the being broke should definitely NOT apply in our case. We are an oil country in the middle of an unprecedented oil boom. We should have cash to burn, and we do, given that we have spent a billion dollars over the last five years on Weapons frmo the U.S. alone. We are not a cash strapped country looking for ways to close up our budget holes. Given our humungous oil windfall economic logic tells we should be exporting capital (just witness the mind-boggling sizes of sovereign wealth funds operated by the neighbouring gulf countries), not selling off our own assets. The above SHOULD NOT BE A REASON to sell off the Hidd plant. a. This should not be a reason to sell off ALREADY EXISTING ASSETS. At most this should be a reason to allow them to keep ownership of newly built assets that they build. Even on only that measure the government has failed miserably. First, it has utterly failed in attracting people to invest and put their own money in NEW projects in the water and electricity sector, although they have been trying really really hard. No one it seems is willing to put their money and risk here. And who can blame them? Given how little the government seems to care about these two crucial sectors when compared to how they’ve taken care of more frivolous projects like Amwaj, Riffa Views, and Durrat Al Bahrain. This takes me to the second point. Given our oil boom the country SHOULD HAVE ENOUGH FUNDS ON ITS OWN to cater to such crucial sectors. They are a priority. We DO NOT NEED external investment, not in these sectors. Given how much we have poured down the Formula 1, etc, we should be able to stomp up an extra 1 billion somewhere to build a decent water and electricity plant which would keep us viable for the next 30 years or so. This should not be hard. Given our government’s obsession with fast bucks however, this money gets instead put on less crucial projects such as: (pick from the list, I’m sure you know it by heart now). 3. Government monopolies are no good. It’s better to let the private sector compete and you will reap the rewards. Just look at how the competition between Vodafone and Batelco has been so good to the country. Prices are down, products are better, everyone is happy (except Batelco). This argument is so wrong on so many fronts. First, just like in the first point, you can have competition in terms of management and delivery of services, no need to sell of your assets. Second, in this case there is no competition to speak off! There is ONE company that the government has sold the whole bloody thing off to! That’s it. And finally, the mechanism at work here is completely different than in something like the telecommunication industry. The way things usually work here is that the government and the company agrees a price at which the government buys the output from the company for a certain period of time (usually several years), then the government sells the output to consumers at a subsidized price (way below costs). Market prices play no role here, although I’,m pretty certain the government’s ultimate goal is to pass on the full price to consumers. Watch out for that coming your way eventually, and by that point if the market functions as it’s supposed to you might be paying monopoly prices since there is only one supplier! In short, there is no real justification for these shenanigans that the government has engaged in. I mean, at the end of the day, it’s pretty darn obvious why it’s better for a small vulnerable country of our size to own its own water and electricity supplies. It’s the same reason why you’d rather own your own house. It’s something that is absolutely vital to you, and you would rather not be dependant on someone else for such a massively important thing, especially when that someone is the only supplier selling such a crucial product which gives him a lot of power and bargaining chips over you! This is such a clear concept, and I suspect the government knows this. The best example to illustrate this is the fact that the only industry who has gone against this privatization trend is the oil industry. The government has bought a 100% of Bapco over the last decade, even though they have pretty much sold everything else. Why? Well they probably know that oil is black gold, and it brings in huge wads of cash, and it is absolutely vital to the state of the country. Electricity and water should be just as vital to a country, except the difference here is that running water and electricity brings nothing but hassle, trouble, and extra expenditure to the government. There is no money to be made here, unlike in the oil sector. In fact there is money to be lost in subsidizing m people. Then you have to deal with the hassle of running and managing the thing and of dealing with public outcries whenever something happens. I suspect this is the real reason, along with the crazy fever of neoliberalism sweeping the region, which has driven such government sales. The most ironic thing about these sales is that they are promoted as evidence of a move towards development and modernity, towards copying more “civilized” countries, while really they are the absolute opposite of this. The only countries that engage in such sale of their most vital assets to completely foreign owned companies are developing “third world countries”. Countries like Jordan, which has sold off its plants to French companies, or countries like those in South America which were forced to sell pretty much anything of value in the countries to Western companies. You’d have to search very hard to find western countries that sell of their electricity and water resources wholesale to some company from a far flung place. Can you imagine the headlines if Saudi Arabia acquired all of the UK’s power and water generating companies? How about if the United States supplies became dependant on Kuwaiti companies? Remember the outcry when a Dubai company dared to buy something as innocuous as the management of a port in the U.S.? And of course water and electricity is nothing but the most extreme, most obvious examples of how horribly wrong this policy has gone. As the respected minister boasts in the article quoted in the beginning, this sale of assets has encompassed many many sectors, and expect more to come if it’s possible to sell them. For I suspect that “Bahrain holdings” company is possibly in many ways a display shop for a garage sale of what’s left in the government’s hands in Bahrain. Want an airline? No problem we have Gulf Air, how much you’re offering? Sold!! How about Aluminum? Who knows until what point this will reach. I doubt this will stop until we will shake off this neo-liberal delirium, and that does not look like it will happen until the oil runs out. Then we will wake up, rub our eyes, and realize that we are in a massive hangover. Just like other third world countries, we will find that all of our important assets and resources are owned by some foreign companies that mean nothing to us (including massive chunks of the sea if this report is to be believed), and just like third world countries, we will find ourselves too oil-poor, too dependant and too vulnerable to do much about it. We will face classic dillemmas faced by developing countries which we shouldn’t because of the oil we have. And the problem is this hangover won’t last for a day but for a really long long time. Enjoy the water you’re drinking and the laptop you’re powering using that electricity folks, just remember that you’re buying it from the Belgians, the British and the Japanese. One by one, heroes of a not so distant time when people were more more principled, more passionate and more optimistic fall. 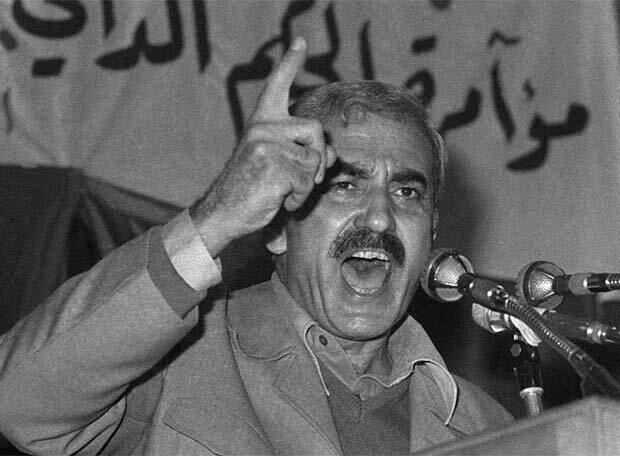 George Habash; Medic, intellectual, visionary, PFLP founder, Arab Nationalist leader, a personal hero and one of the most remarkable people to ever set foot on this earth has died. His body may have fallen, but his ideas, actions and dreams will continue to inspire us to the future he made us thirst for. I can not express it better than Karma Nabulsi, so I simply link to her words. Rest in peace George Habash and may some of us live up to our duty of making all of your dreams come true.